Fresh figs are one of my top three favorite fruits, so I had to laugh when I realized there are no fig recipes on the blog. I grew up eating them off of the tree in my grandmother's backyard, checking on the tree every so often for weeks in advance anticipating their ripening and hoping we'd get to them before the birds did. These plump deeply purple-brown jewels, when perfectly sun-ripened have a unique earthy, berry-citrus flavor and I love to eat them fresh, just as they are. But I'm branching out today and decided the next best way to eat them is blended with carob in a late-summer smoothie. Surprisingly enough however, this has now moved up to my favorite way to eat figs because I feel like I can celebrate them in a special way while still enjoying them raw so as not to compromise their unique flavor. Carob also flourishes in hot, dry climates so this is another example of following nature's cues by pairing foods that naturally grow up together. Carob is the newest member of my pantry community. It's great in raw desserts and smoothies when I want a hit of something rich and dark. Carob grows in pods on a tree and is ground into a powder resembling cocoa powder. It is often used in place of cocoa powder or cacao in baking, but it does not taste the same. It has a sweeter, more delicate flavor, and it does not contain the stimulating properties of chocolate, which I sometimes prefer. Here in particular the delicate, sweet flavor, together with a squeeze of orange compliments the fig nicely. There is so much hype over superfoods like chia seeds, hemp seeds, goji berries, etc. that we overlook the powerful superfoods found in all of our markets: fruits and vegetables and accessible products like raw cacao and carob powder. Although I often enjoy chia and hemp seeds for the fantastic nutritional boost they provide, I choose not to talk about them much on the blog because I consider them to be a helpful supplement rather than essential for a healthy and whole diet. Carob and figs are just as much a superfood, and they are paired with chia and hemp seeds in this smoothie to give a super anti-inflammatory boost. No matter what "diet" we subscribe to we should all be adding more anti-inflammatory foods to our daily meals, and the carob, fig, hemp, and chia seeds all play a role in fighting inflammation. In a few days I will be back with a post on anti-inflammatory foods and why they are so important. Until then, I hope you treat yourself to some fresh figs and enjoy them in this late-summer smoothie! Add remaining ingredients and blend until smooth and creamy. Pour into a bowl, top with sliced fig, and enjoy! *This is my secrete shortcut to replacing nut milk in a smoothie when I don't have any on hand. No straining nut pulp required! And if I know the smoothie will not be as sweet I'll also blend a date or two into the hemp milk. If you don't have hemp seeds on hand, replace water and hemp seeds with 1 cup of almond milk or another plant-based milk. If you're looking for a fun and unique homemade gift idea for the holidays, this could be your answer. Loose rooibos tea leaves are infused with chai-inspired spices to make a festive winter-warming tea. But I have to warn you, a rogue spice found its way into the bunch. It is Chinese five spice powder! If you're not familiar with five spice powder, it is a combination of cinnamon, fennel, clove, star anise, and black pepper. Though not a traditional Chai ingredient, it melds perfectly with the other spices because it capitalizes on the spicy-sweet notes for which Chai is famous. Plus its ground powder form permeates the entire tea mixture giving it the most delicious aroma. The five spice powder adds something extra but if you don't happen to have it on hand the remaining spices still give the tea a wonderful flavor. We went to Switzerland's Slow Food festival in November. Local producers of cheese, chocolate, meat, wine, and the like set up shop to give away samples and sell their products. It was a great way to learn more about the local food scene, and I was pleasantly surprised to run across a few small-scale artisanal start-ups featuring yummy creations like raw fudge, raw energy bars and rooibos tea mixes. This spotting was my inspiration to go home and make my own rooibos tea fusion. Whether it is this tea or another, I hope you find time to sip on something festively flavorful in the coming weeks. And in the meantime I will be back soon with my last post of the year to share a favorite oven-baked breakfast skillet recipe that is quick to put together and perfect for company. And finally, before I leave you with the recipe, I cannot wait any longer to tell you that I have a BIG surprise in store for you in January! I am not going to give it away yet, but let me put it this way. It has been in the works for months. And if you want to get your new year off to a good start you will definitely want to tune in and tell your friends and family because you are in for a real treat! Break cinnamon sticks into small shards and crush cardamom pods with the back of your knife. Place all ingredients in a medium mixing bowl and stir to combine. Divide among desired airtight containers to store. Notes: I like steeping this tea in milk (usually oat or almond) because the richness of the milk, opposed to water, allows the flavors of the tea to really shine. Prepared this way, I enjoy it at night especially, as a non-caffeinated alternative to hot chocolate. Place 1 1/2 cups milk of choice in a small saucepan with 3 teaspoons of tea. Cover and warm over medium heat (~5 min). Don't let milk boil! Remove from heat and let steep, covered (~10 min). Strain tea into a mug, sweeten with honey, and enjoy! What do you think of smoothies, the healthy variety that is? I really am curious to know. Are they an efficient way for you to pack a meal in a glass, do they fit well into your lifestyle, or do you think they are overrated? Smoothies, especially green smoothies, are cooling, cleansing, and lightening, great for warm weather. In the cooler months I look for less cleansing and more grounding and nourishing properties to maintain a balanced state to support my immune system and counteract the cold outside. So inevitably my smoothie consumption goes down in the Autumn and Winter, but when I do have one it's a denser version that I try to consume at room temperature. So without further ado, I would like to introduce to you Green Smoothie's more nurturing and heftier cousin, the Oat and Pear Smoothie. The flavor is pleasant without being aggressive, it is calming, almost neutral without being boring. The vanilla, cinnamon, and dates bring out the sweet side of earthy. And the steel-cut oats and almond butter ground the smoothie into something substantial. And remember, although it is a smoothie, treat it like any other breakfast and sip it slowly, even chewing it a little. I will often spoon it out of the glass instead of drinking it. Adding additional chopped pear and dates to individual glasses would give a nice reason to use a spoon and add texture. Notes: If your dates are not soft, soak them in warm water for 10 minutes while preparing the rest of the ingredients. If possible, take the oats and almond milk out of the fridge first thing in the morning so they come to room temperature while you are getting dressed. Remove oats, lemon, and almond milk from the refrigerator and bring to room temperature. Add all ingredients to a blender, and blend until smooth, or to desired consistency. If there are pieces of pear and date that don't get blended, that's okay. In fact, adding additional chopped pear and dates to the smoothie would be delicious. 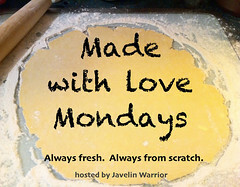 I am sharing this recipe with Mark over at Javelin Warrior's Cookin' W/ Luv for his Made WithLove Monday weekly series that celebrates recipes made from whole, natural ingredients.